Pia's love of teaching began over 30 years ago as a private trainer, dance instructor, and track, field and swimming coach for the Special Olympics. Her academic background was gained through the training of the world-renowned President, CEO and Founder of the famous Cooper Aerobics Center, Dr. Kenneth H. Cooper, M.D., M.P.H. She achieved the highest level of training by becoming a Regional Clinician for the first international aerobics corporation where she trained hundreds of new instructors in the field. 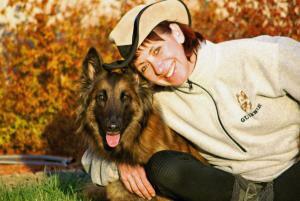 She eventually combined her love of coaching and teaching people with her other fondness – – dogs. Pia is Director of Training and Behavior at St. Hubert's Animal Welfare Center located in Madison, New Jersey. She has developed various courses focusing on positive, reward-based techniques, which are extremely effective in the enhancement of the bond and relationship of the dog and her human companion. The result of her efforts is an astounding 100+ classes per week, which includes 8 levels of pet training classes, specialty courses designed for dogs with extreme behavioral problems and much more. Pia also developed a canine coach program where volunteers and apprentice trainers work with shelter dogs on a daily basis to help the dogs become more adoptable by achieving and maintaining good manners, as well as offering behavioral wellness while in the shelter. Through word of mouth and a good reputation about the behavior department, St. Hubert’s now has a very successful private consultation department for pet owners specializing in aggressive and anxiety-related problems for dogs and cats. Pia lectures internationally, has been written up in many magazines, appeared on television and is the author of “Raising Puppies and Kids Together – A Guide for Parents.” She has made contributions to many other books and routinely writes behavioral articles for various magazines around the world. them in improving and expanding their programs. She shares her home with husband, Marty, as well as their 6-year-old Belgian Tervuren, Guinn, her 2-year old niece, Lena and her eighteen week old step-brother, Gilly. Pia competes in Obedience, Rally-O, Agility, and continues to enjoy dancing but now with her dogs!